What Does a Personal Trainer Eat for Breakfast? Pancakes! This COULD have been a pancake! As a personal trainer, I’m often asked what I eat and what I refuse to eat. Honestly, I don’t really have a set template or strict rules for myself when it comes to my healthy eating plan. I’m a strong believer in enjoying all foods in moderation and listening to your body. This means that my eating habits often vary significantly from one month to the next, because I base my daily diet on what my body tells me it needs. For example, until I started marathon training a few months back, I hadn’t thought about peanut butter in years —as in since my peanut butter and fluff days (so it had really been decades since my last PB craze!). But, lately? I’ve been craving peanut butter all the time, especially after my long runs. My favorite Halo Top Creamery ice cream right now is peanut butter cup, something I never would have believed had you looked into your crystal ball and told me this in January. I’m sure in a few months I’ll have some new food craving and I’m fine with that! However, there is one meal that rarely changes for me and that’s my breakfast. For the past five years, I’ve had the same breakfast nearly every day and it’s…. pancakes. No, not a green smoothie or green juice (more on why HERE or HERE if you want to ask me about my favorite detox). Pancakes. And I highly encourage you to follow my lead! Even if you’re one of my weight loss clients. Now, don’t get me wrong. I’m not saying to go to a greasy diner every day for your pancakes or have the only pancakes I liked in college, chocolate chip ones aka chocolate chip cookies. The pancakes I’m urging you to add to your daily routine are a healthy version of the breakfast staple. However, I think you’ll find them surprisingly good and thanks to their fiber and protein focus, enough to keep you feeling full and energized for most of your busy mornings! Has all this reading made you hungry? Let’s move on to the recipe! Step One: Make your batter by placing all batter ingredients into a food processor and processing until they are combined. The batter should look a lot like regular pancake batter. If it still looks like the start of oatmeal cookies, you want to keep processing. Step Two: Use your batter like you would any pancake batter. Spoon it onto a frying pan misted with canola oil cooking spray. You’ll also want to add in most or all of your fruit during this step. As with any pancake, flip yours when the edges start to look cooked (about 2 minutes each side when using medium heat). Step Three: Prepare for greatness! Top your finished pancakes with yogurt and honey. That’s it! You’re ready to join the pancake party. Think this sounds good, but you don’t have time to eat let alone make breakfast every morning? I’ve been there, but you CAN do this! It really doesn’t take long to make this breakfast and you can even prepare some of the ingredients ahead of time. Before the weeks starts, I measure out the oatmeal and cottage cheese so I can crack an egg and go. It might seem like a silly food prep step if you’ve seen some of the prop meal prep on Pinterest, but it works! When I don’t have these items measured out, I often reach for some pretzels and am starving in an hour. Sure, I don’t even save myself a full minute with this mini meal prep step, but it’s proof that the 20-Second Rule is REAL, because it does make all the difference. It’s why I really have had pancakes for breakfast 99.9% of the mornings I’ve eaten from home the last 5 yrs. I have pretty packed days as the owner of a fitness company. I still work with private clients and do all my own marketing and networking to promote my business. If you’re like me, I’m sure you’ve found that it’s easy to forget to eat or reach for something “easy” when you’re on the run. 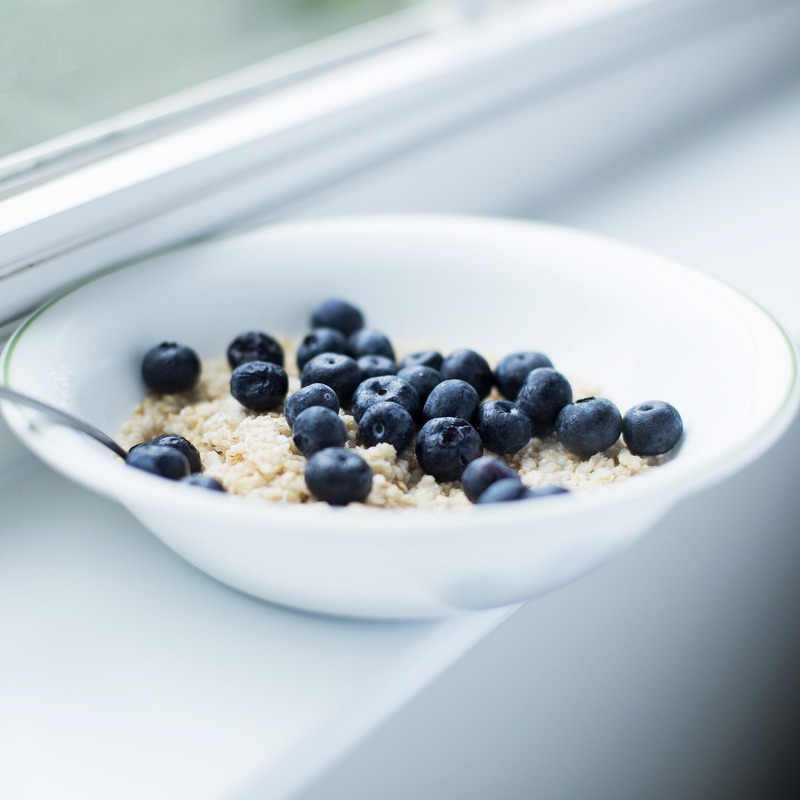 Starting your day by fueling yourself with a healthy breakfast makes all the difference. In addition to helping you feel energized in those early hours, it helps set the tone for your day. Eat a healthy breakfast and you’ll likely continue to make healthy choices the rest of the day. Catherine Basu, MEd is an ACE-Certified personal trainer, the owner of Fit Armadillo®, and author of Superwomen Secrets Revealed: Successful Women Talk About Fitting in Fitness and Dare You to Join Them. She has zero tolerance for diets, supplements, and detoxes and not just because she’s a huge fan of gluten-FULL bread, but lots of love for those new to fitness. An avid runner, she has competed in races from the 1500m to the full marathon, and loves helping others start a running routine. Obsessed with running, the beach, supporting other lady bosses, & her nieces! Visit her website FitArmadillo.com for more tips and to start enjoying fitness at your place and your pace! Why now? Food allergies late in life, really!